Felicia has shared workshops and presentations to various audiences and communities with a mix of age, gender, education since 1997. Her welcoming demeanor and passion for community and transformation are apparent in her work, art and presentations and are always shared. Felicia has donated her time to hundreds of events. Honorariums for these presentations are most welcome and deeply appreciated and help keep the work flourishing. Thank you! See more about performances, keynotes, workshops, etc. at the One Sheet below. Felicia is available to perform, keynote, and lead a workshop at your campus or center. 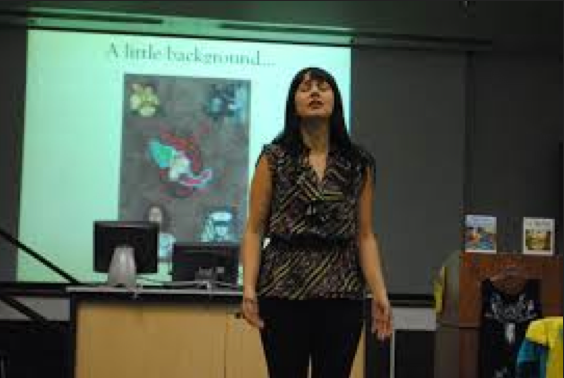 She has shared at a wide range of events, including everything from Culture Days, Raza Day’s, Xicana Week, Women’s Week, Poetry Month, Sexual Assault Awareness Month, Take Back The Night, Indigenous People’s Day/Night and Heritage Months for the Raza and Indigenous communities, graduations, ceremonies, and more! What LArtivists learned from the Z’s. Graduation – It is Time! 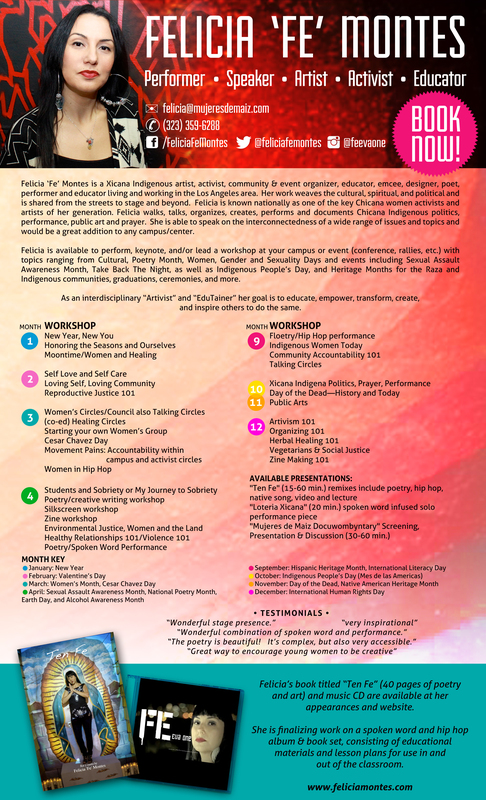 The workshop is a beginning dialogue regarding sexism, gender politics and issues within movement organizing as well as sharing of resources and ways to begin to not only challenge patriarchy but also to flesh out & embody feminism and create spaces of healing and empowerment of all peoples. A presentation by Felicia ‘Fe’ Montes on how Artivism (art and activism) can educate, empower, inspire and transform people and communities. Fe shares various examples of projects created with different causes and mediums for this purpose including her own work, and that of the groundbreaking Los Angeles women’s collectives In Lak Ech and Mujeres de Maiz. Based on indigenous and ancestral ways of relating with each other, these circles allow groups and individuals to open up to each other and to the sacred within us all. The circle encourages dialogue, respect, sharing, and learning among members of a group and values the interconnected culture, teachings and knowledge of all especially that of Indigenous ways. The symbolism of the circle, with no beginning and with no one in a position of prominence, serves to encourage people to speak freely and honestly in a safe space. A workshop on how you can honor Cesar Chavez Day and farmworkers in your community or campus. Basic information and background regarding Cesar Chavez and the United Farm Workers Movement are shared including a video as well as various resources (sample curriculum/lesson plan referrals). How to’s including organizing an assembly, special event at your location, and service projects are discussed/shared. A presentation and talk about non-traditional jobs working within art and social justice arena and creating your own career and path in communities of color. Participants will hear the personal journey of a womyn of color artivist, Felicia ‘Fe’ Montes, and the path she has chosen to create as the Zapatistas say “ a world where many worlds fit.” Discussion will also bring up sexism, payment, and treatment of artists within social movements, artist unions, issues of cultural capital and more.